Senior dog Slab has a loyal nature and heart of gold – typical of the Staffy breed. But, his love for people was so strong that he just couldn’t cope without them. “Slab wasn’t coping in the shelter environment and we wanted to see how he would settle into a home,” said Gemma, adoption attendant at the Home. 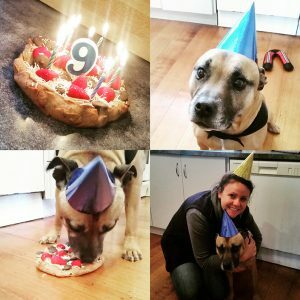 “The very first night we brought him home, he waddled through the door, greeted our other dogs and cats, and then hopped up onto the couch like he had lived there forever. 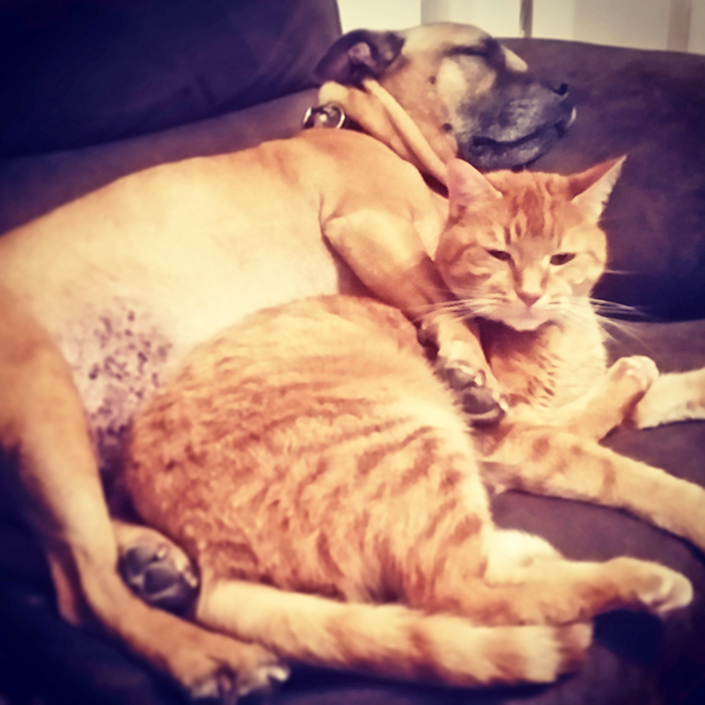 “My partner and I have been a revolving door for foster pets over the last five years. Slab was by far the most amazing foster we had ever had. Slab was placed into the Home’s Behaviour Program to help him conquer his separation anxiety. Using positive reinforcement training, our behaviour team taught Slab independence skills, such as settling on his mat and enjoying relaxation time in his crate. This helped to build his confidence and show him that spending time alone wasn’t so scary after all. Slab spent three months in foster care with Gemma and her partner, who became incredibly attached to him. So, they decided to make him a permanent member of the family. We simply couldn’t bear the thought of not seeing him every day. When we talked about it, we pretty much ran out of reasons why we shouldn’t adopt him,” said Gemma. Slab made fantastic progress during his time in the Behaviour Program. 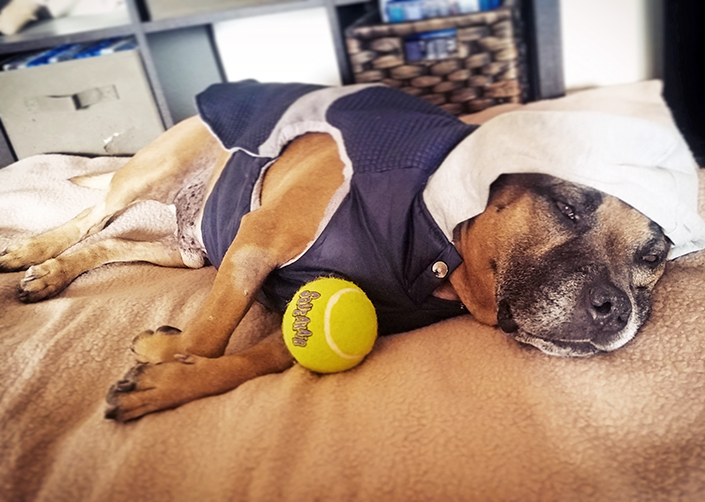 With the aid of anti-anxiety medication, his anxiety was reduced while his learning capacity was increased, allowing him to focus on his training. Because of this, Slab was able to enjoy a very smooth transition into his new home. “Slab walked straight in our door and made himself at home. It’s honestly like he has always been here,” said Gemma. Slab is now quite content being home on his own, so much so that sometimes when we walk in the front door, he doesn’t even get off the couch. He just lifts his head, wags his tail a little, then goes back to napping. “Slab loves going to the river for a swim. It doesn’t matter what the temperature is – he doesn’t care. His second favourite thing is running off lead at the park, and he is surprisingly quite fast! 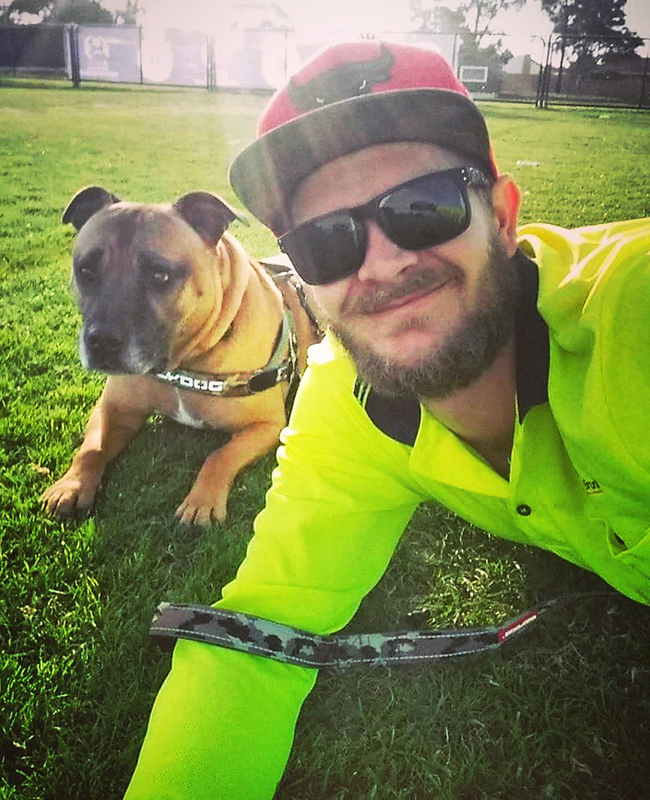 We love watching him zoom around with his big Staffy smile. “We love everything about Slab, but most of all we love how much he loves us and how happy he is in our home. “Slab is the gentlest and sweetest dog we have ever met. He is beautiful with all our other animals and everyone he meets. If you’re ready to experience the love of a shelter dog like Slab, change a life and adopt your new best friend today!